Attendees of the 2017 Quad Cities Farm Equipment Show will have an opportunity to see the latest planting and harvesting equipment up close. 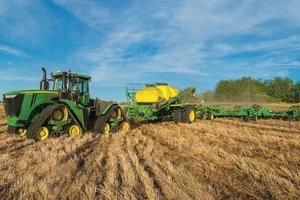 John Deere will be one of the many exhibitors participating in the 2017 Quad Cities Farm Equipment Show, scheduled to take place between January 15 and 17 in Rock Island, Ill. There will be more than 200 exhibitors at the event, which is designed to prepare producers for their next planting and harvesting seasons. “How do I get more and pay less? That becomes the question, and so many of these smaller more nimble companies feel that they have the answer and very often it is high tech or new money-saving attachments that can go on the current equipment to make them more efficient,” said Richard Sherman, show manager, in reference to some of the equipment that will be on display. Many of the exhibitors who will be at the show will be bringing their new equipment, designed to speed up the planting and harvesting process without reducing efficiency. “Of course, the heart of a show is still the equipment, and with the large move-in doors we have at the QCCA, we have the room and the ability to bring in the big equipment. I think farmers know that no matter how tight money is, a day spent at the farm show is always a good investment,” says Sherman. He emphasized that the heart of the show is the equipment, regardless of whether small or large businesses participate in the event. Show admission and parking will be free, and the event will take place at the QCCA Expo Center. More information can be found by visiting www.quadcitiesfarmshow.com.